, an ingenious divine, of unfortunate memory, was born in 1729, at Bourne in Lincolnshire; of which place his father, of the same names, was many years vicar. After being educated at a private school in classical learning, he was admitted a sizar of Clare-hall in Cambridge in 1745, where he gave early proofs of parts and scholarship, and so early as in 1747 began to publish little pieces of poetry. In this year he published (without his name) “A Pastoral on the Distemper among the horned cattle;” in 174y, “The African prince, now in England, to Zara at his father’s court,” and “Zara’s answer;” in 1750, “A day in Vacation at College,” a mock-heroic poem in blank verse abridgments of Grotius “De jure belli et pacis,” and of Clarke on the | being and attributes of God, with sir Jeffrey Gilbert’s Abstract of Locke on the human understanding, all inscribed to Dr. Keene, then vice-chancellor of the university, and afterwards bishop of Ely, under the title “Synopsis compendiaria Librorum H. Gfotii de jure belli et pacis, S. Clarkii de Dei existentia et attributes, et J. Lockii de intellectu humano.” He published also, while at Cambridge, “A new Book of the Dunciad, occasioned by Mr. Warburton’s edition of the Dunciad complete,” in which “Warburton is made the hero. 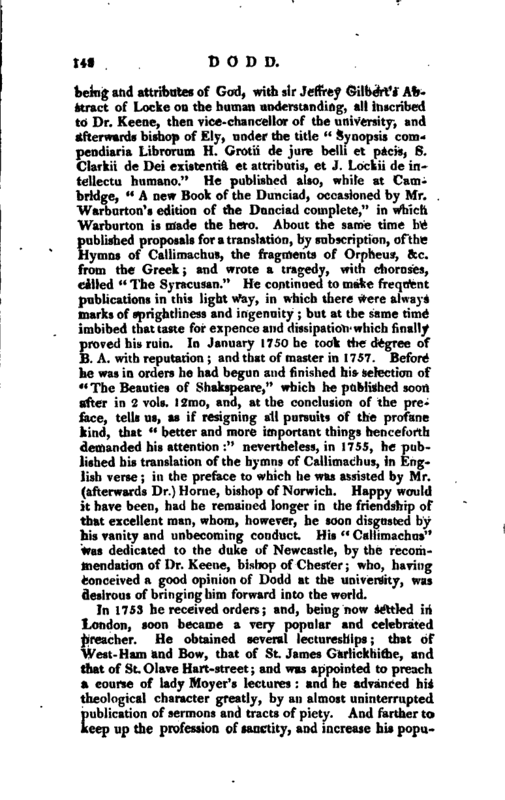 About the same time he published proposals for a translation, by subscription, of the Hymns of Callimaehus, the fragments of Orpheus, &c. from the Greek; and wrote a tragedy, with choruses, called” The Syracusan.“He continued to make frequent publications in this light way, in which there were always marks of sprightliness and ingenuity; but at the same time imbibed that taste for expence and dissipation which finally proved his ruin. In January 1750 he took the degree of 13. A. with reputation; and that of master in 1757. Before he was in orders he had begun and finished his selection of 4< The Beauties of Shakspeare,” which he published soon after in 2 vols. 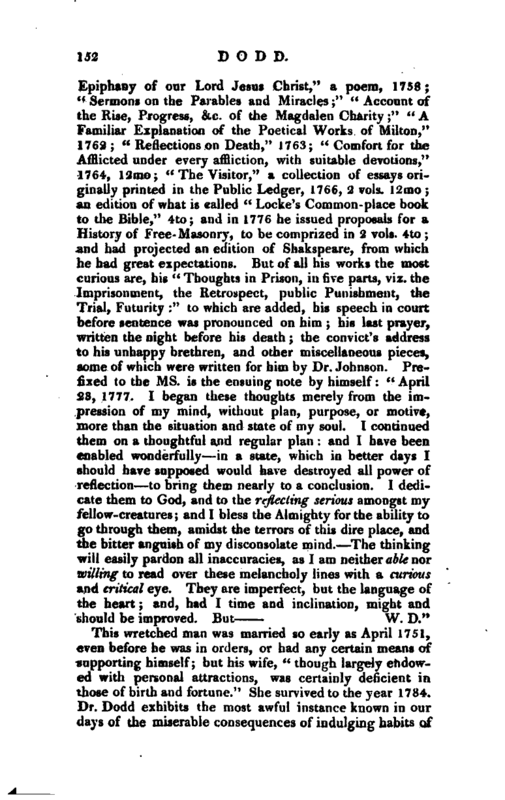 12mo, and, at the conclusion of the preface, tells us, as if resigning all pursuits of the profane kind, that “better and more important things henceforth demanded his attention:‘’ nevertheless, in 1755, he published his translation of the hymns of Callimachus, in English verse; in the preface to which he was assisted by Mr. (afterwards Dr.) Home, bishop of Norwich. Happy would it have been, had he remained longer in the friendship of that excellent man, whom, however, he soon disgusted by his vanity and unbecoming conduct. His” Callimachus" was dedicated to the duke of Newcastle, by tile recommendation of Dr. Keene, bishop of Chester; who, having conceived a good opinion of Dodd at the university, was desirous of bringing him forward into the world. In 1753 he received orders; and, being now settled in London, soon became a very popular and celebrated preacher. He obtained several lectureships that of West- Ham and Bow, that of St. James Garlickhithe, and that of St. Olave Hart-street; and was appointed to preach a course of lady Moyer’s lectures and he advanced his theological character greatly, by an almost uninterrupted publication of sermons and tracts of piety. And farther to keep up the profession of sanctity, and increase his | popularky, he was very zealous in promoting and assisting at charitable institutions, and distinguished himself much in. regard to the Magdalen hospital, which was opened in August 1758: he became preacher at the chapel of this charity, for which he was allowed yearly I Oo/. But, notwithstanding his apparent attention to spiritual concerns, he was much more in earnest, and indeed in earnest only in cultivating his temporal interests; but all his expedients were not successful, and his subservient flattery was sometimes seen through. In 1759 he published in 2 vols. 12mo, bishop Hall’s Meditations, and dedicated them to Miss Talbot, who lived in the family of archbishop Seeker; and, on the honour the marquis of Granby acquired in Germany, addressed an ode to the marchioness. His dedication to Miss Talbot was too extravagant a piece of flattery not to miss its aim, and gave such offence to the archbishop, that, after a warm epistolary expostulation, his grace insisted on the sheet being cancelled in all the remaining copies. 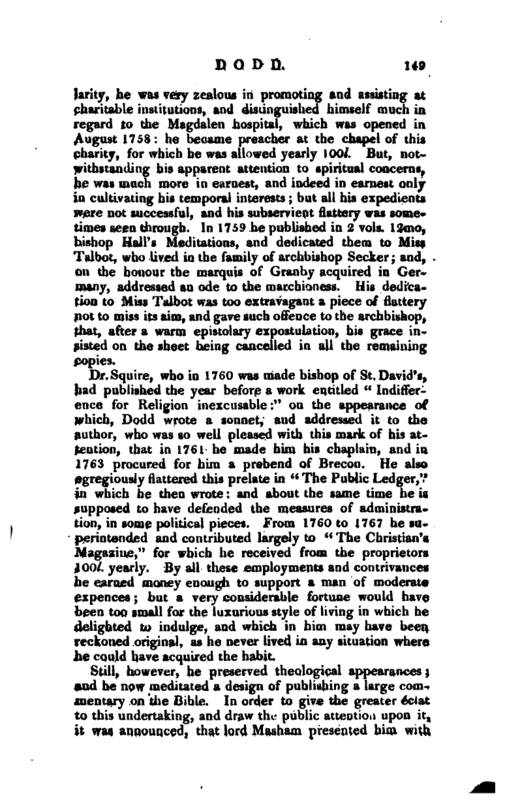 Dr. Squire, who in 1760 was made bishop of St. David’s, had published the year before a work entitled “Indifference for Religion inexcusable:” on the appearance of which, Dodd wrote a sonnet, and addressed it to the author, who was so well pleased with this mark of his attention, that in 1761 he made him his chaplain, and in 1763 procured for him a prebend of Brecon. He also egregiously flattered this prelate in “The Public Ledger,” in which he then wrote: and about the same time he is supposed to have defended the measures of administration, in some political pieces. From 1760 to 1767 he superintended and contributed largely to “The Christian’s Magazine,” for which he received from the proprietors 100l. yearly. 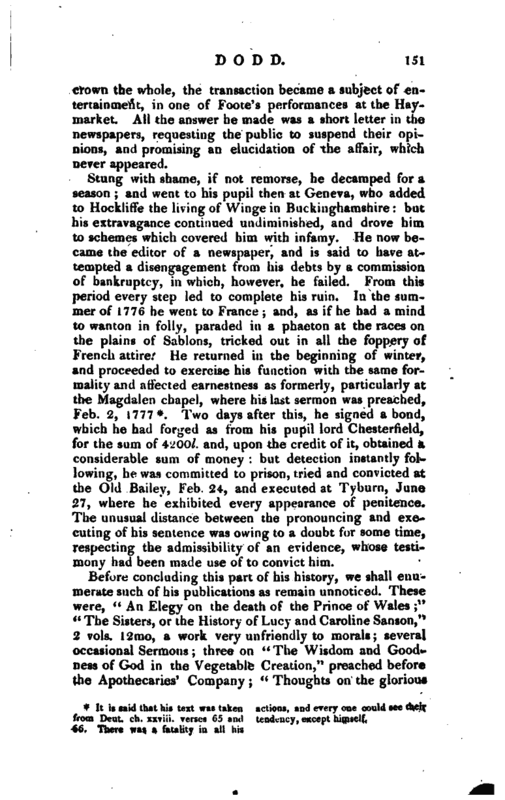 By all these employments and contrivances he earned money enough to support a man of moderate expences; but a very considerable fortune would have been too small for the luxurious style of living in which he delighted to indulge, and which in him may have been reckoned original, as he never lived in any situation where he could have acquired the habit. Still, however, he preserved theological appearances; and he now meditated a design of publishing a large commentary on the Bible. In order to give the greater éclat to this undertaking, and draw the public attention upon it, it was, announced, that lord Masham presented him with | Mss. of Mr. Locke, found in his lordship’s library at Oates*; and that he had helps also from Mss. of lord Clarendon, Dr. Watcrland, Gilbert West, and other celebrated men. He began to publish this commentary, 1765, in weekly and monthly numbers; and continued to publish it regularly till it was completed in 3 vols. folio. It was dedicated to his patron bishop Squire, who died in May the year following, 1766; and was lamented (we believe very sincerely) by our commentator, in a funeral sermon dedicated to his widow. This year he took the degree of LL. D. at Cambridge, having been made a chaplain to the king some time before. His next publication was a volume of his poems, in 8vo. In 1769 he published a translation from the French, of “Sermons preached before Lewis XV. during his minority, by Massillon, bishop of Clermont.” They were called “Sermons on the duties of the great,” and inscribed to the prince of Wales. 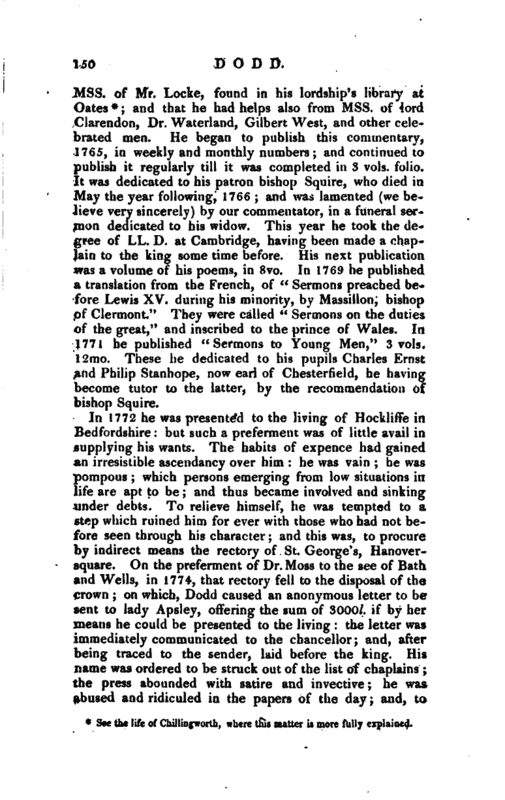 In 1771 he published “Sermons to Young Men,” 3 vols. 12mo. These he dedicated to his pupils Charles Ernst and Philip Stanhope, now earl of Chesterfield, he having become tutor to the latter, by the recommendation of bishop Squire. See the life of Chillingworth, where this matter is more fully explained. | crown the whole, the transaction became a subject of entertainment, in one of Foote’s performances at the Haymarket. All the answer he made was a short letter in the newspapers, requesting the public to suspend their opinions, and promising an elucidation of the affair, which never appeared. It is said that his text was taken from Deut. ch. xxviii. verses 65 and 66. There was a fatality in all his actions, and every one could see that tendency, except himself. Two days after this, he signed a bond, which he had forged as from his pupil lord Chesterfield, for the sum of 400l. and, upon the credit of it, obtained a considerable sum of money but detection instantly following, he was committed to prison, tried and convicted at the Old Bailey, Feb. 24, and executed at Tyburn, June 27, where he exhibited every appearance of penitence. The unusual distance between the pronouncing and executing of his sentence was owing to a doubt for some time, respecting the admissibility of an evidence, whose testimony had been made use of to convict him. Memoirs prefixed to his “Thoughts in Prison.” Historical Memoirs of his Life and Writings, 1777, 8vo, written by the late Isaac Reed. 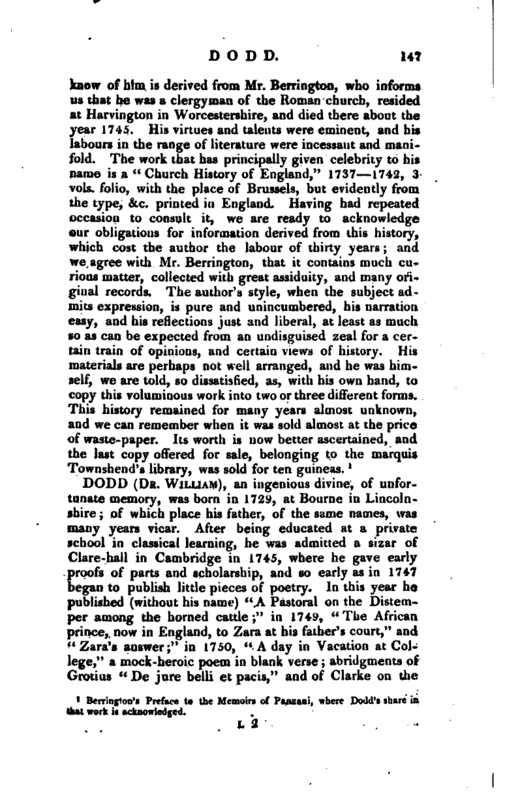 Jones’s Life of Home, p. 54. —Gent. Mag. LX. 1010, 1066, 1077, where are some feeble attempts to prove him a penitent. 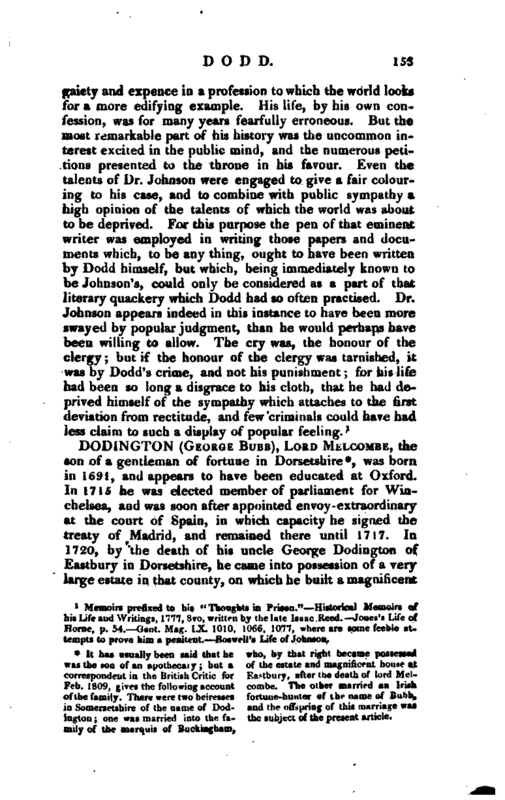 —Boswell’s Life of Johnson.